Children may face eating challenges for various reasons. Children with extreme picky eating tend to experience higher levels of anxiety, around food and in general. Perhaps the most anxiety-provoking feeding challenge that parents face is life-threatening food allergies. Some children with extreme picky eating also struggle with food allergies, which can complicate the picture even further. Kristin Beltaos has made it her mission to help parents and children not just be safer and healthier, but thrive. We were intrigued and impressed with Kristin Beltaos’ work with parents, children, and schools (A Gift of Miles). She has graciously agreed to share some wisdom in our first guest blog post. 1. We are intrigued by your “Spotlight of Difference” TM. Can you tell us more? It’s fascinating how when we are confronted with a challenging situation, such as creating a safe environment for a food allergic child, our initial instinct is to determine how a child will adapt to our environment, rather than how the situation can be modified so that it’s safe for everyone. When we only address the individual child it will almost always create a Spotlight of Difference TM. 2. How does this relate not just to food allergies, but also children with extreme picky eating, and even beyond food, to other differences? 3. How can children with food allergies be kept safe while not made to feel different? How can schools do better for all children? 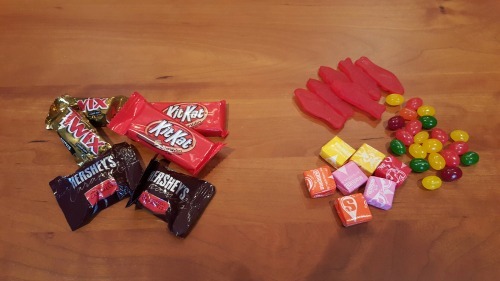 Let’s look at the peanut-free table for our discussion. A peanut-free table, or it can be referred to as an allergy table or an allergy aware table, is provided to create a safer environment for children with food allergies. The table is cleaned per set food allergy procedures. Peanut and nut related products are not eaten at this table. Children with food allergies may invite a friend or two to sit at this table as long as their lunches are free of nut products. Food allergy tables are essential in the early childhood period; however, once a child is in second grade we need to think more creatively on how to integrate or transition a food allergic child to the classroom lunch table. By second grade, a child with food allergies is more mature, able to understand how to care for him/herself and is growing in his/her independence. In addition, most peers are more mature and aware of the seriousness of food allergies. 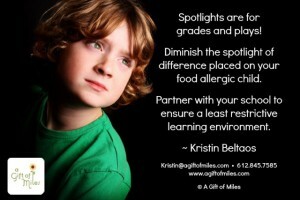 Think about the spotlight that we put on children sitting at an allergy table. Often times these children aren’t typically friends with one another, rather they are placed together due to a common health condition. Many people will tell me that it’s okay because we allow children with a safe lunch to sit at the allergy table…but let’s be honest that doesn’t always work out. I’ve heard of children feeling like they have to lobby with their friends to come sit with them. Can you imagine having to lobby with your friends to sit with you? If a food allergic child is concerned about sitting alone at lunch, and has to lobby, how focused is that child on learning? This worry is a distraction, plus it builds anxiety in the child. There are solutions to better integration, but it does require some creativity. This solution has been used for many years, but I decided to utilize my Italian heritage and attach a name to it, The Tony Soprano. Tony sat at the head of the table during his family meals, so a child with food allergies has an allergy-safe desk placed at the head of the classroom lunch table. This is a great option for a child transitioning from the allergy table to the classroom lunch table. It’s also the perfect setup for a child with multiple food allergies as it adds the added security of having their own surface; yet sit with their friends of choice rather than similar health condition. A lunchroom monitor can wipe the corner of the classroom lunch table and bench. Then the child can sit at a safe surface, and if extra protection is necessary, use Solution #3. Once your child is a bit older, pack a paper towel or cloth napkin in your child’s lunch. Sitting at the lunch table is much like sitting at a picnic table at the park. Have your child lay the towel or napkin on the table and place their lunch items on the protected surface. While I’m sure the non-allergic would be upset with this suggestion, a peanut table is a viable option. This solution is more difficult to enforce, as it requires the honor system of peanut eaters; however, we aren’t asking anything different from peanut eaters than what we ask of a food allergic child. The reason that this is more appealing is that eating peanut products is a choice, while having a food allergy isn’t a choice. This option is obviously the least popular. 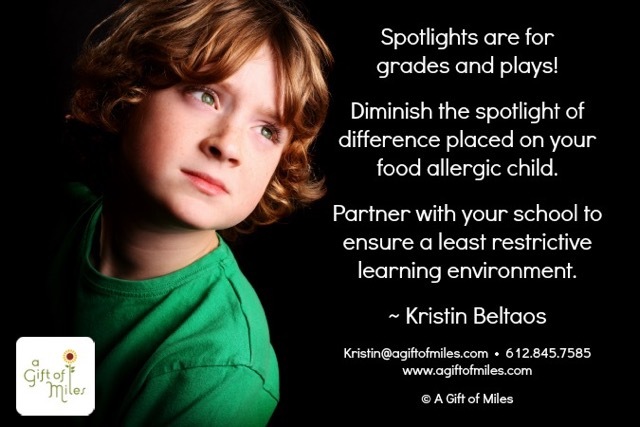 We shine a Spotlight of DifferenceTM frequently, whether it’s the allergy lunch table, having treats in class in which an allergic child cannot partake of, curriculum projects that utilize allergens, seasonal projects, incentives and rewards with food, etc. All of these situations call us to be more creative, more compassionate about what we place upon these children that already have a lot on their minds. 4. Anything else you want to share with us? In our society, invisible disabilities and challenges cause many to question the viability of the disability. When you look at food allergic children, it’s difficult to see the life threatening nature of their condition when they aren’t in the throws of an anaphylactic reaction. These individuals “look healthy” and unfortunately are regularly judged by others. People often have higher expectations of individuals with invisible disabilities and they are treated like they are faking their challenge or simply need to get their “act together” in order to live life under the “normal” expectations of others. I challenge us to rethink our approach and become more compassionate and thoughtful in the way we address people with food allergies or other invisible disabilities. Tell us about your work at your business, A Gift of Miles. I offer specialized consulting services to individuals, couples, and families who seek help managing food allergies, and other stresses in life such as reproductive challenges, employment transitions, balancing motherhood, managing life’s everyday chaos, aging parents and parental loss, etc. 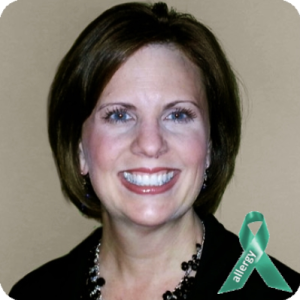 With regard to food allergies, my mission is to support and advocate for individuals and families transitioning to a life of managing life-threatening food allergies and the stresses associated with adjusting to a new normal. Additionally, I’m a Licensed Trainer with the Minnesota Center for Professional Development and an Online Instructor for Eager to Learn, an e-learning program of Child Care Aware of Minnesota, teaching continuing education to early childhood and school-age providers and educators on how to keep food allergic children safe, happy and included. Specific to families, I say that I pick up where your physician leaves off. After a food allergy diagnosis, specifically of a child’s, parents need to address all aspects of their lives. This includes, but certainly isn’t limited to life at home, childcare, school, work, play, leisure, shopping and travel. Many food allergy veteran families come to me for help navigating a new phase in their lives, i.e., transitioning to self-carrying or middle school, etc. My work with early childcare providers and educators includes training, food policy development, the development of food allergy 504 Plans and Food Allergy Management Plans, and the mediation of disagreements between families and schools…and much, much more. Newsletter Sign Up Individuals can sign up using the right hand column sign up box.